Quainton is perhaps typical of a mid-Buckinghamshire village, even today having a population of only 1200. It still has a rather pleasing (and technically functioning) windmill and eight surviving almshouses, operated for many years by Winwood’s Charity and dating back to 1687. In more recent times, life around this tranquil spot has been disturbed, in particular, by the Second World War. This introduced a prisoner of war camp, occupied by Italian prisoners between, so far as I can tell, 1942 and 1946. I have struggled to locate this site (rather less is known about the large number of prisoner of war camps in the UK than one might expect), but a 1948 aerial photo suggests it might have been alongside the eastern edge of station road. Although prisoners could be moved by road this consumed time, troops and petrol all of which was scarce. Prisoners were often moved by rail, and the location near a station is unlikely to be accidental. Another wartime feature was the establishment of a food buffer depot just south of the station. With wartime food supplies so reliant on importation the risk of serious food shortage was felt to be acute and numerous government food ‘buffer’ depots were established in which food could be stored safely for extended periods. The idea was that the stock could be rotated, but that in an emergency the contents could be drawn down to keep supplies available for a while. In 1943 6.5 million tons of food were being stored in the UK and the depot at Quainton stored flour in a large brick building and sugar and sultanas in large corrugated huts, supposedly secured against rodents. The depots were all located where both road and rail facilities were good. At Quainton, the depot backed onto the railway yard and was only a mile from the main A41 trunk road. Quainton Road today the buffer depot huts in a neat military line at centre and to right. After WW2 and the rapid emergence of the ‘cold war’, and the prospect of nuclear strike, the government decided to continue operating the buffer depot system. There was a degree of optimism that if the worst happened transport would somehow be available to move food, and that power would be available to cook it (and people to eat it), but that is another story. By the 1960s the government estimated that stocks in or en route to shops would provide food for 33 days, and that the strategic stockpile in the buffer depots might provide enough food for 23 further days. This fell short of the entirely arbitrary 3-months of food stocks aimed for, but even by the early 1960s cold war planning for protecting the civilian population was degenerating rapidly. In the 1960s the reserve had fallen to around 600,000 tons, and by 1971 just 400,000 tons, against a rising population. The food (some of it tinned and quite old) was in good enough condition to sell into the market and create cash to keep the system operating for a while. When the Aberdeen typhoid outbreak occurred in 1963, it was quickly traced to contaminated corned beef which local officials suggested had had been part of a 13-year old ‘nuclear’ stockpile, but this was wrong—the stockpiled material was OK and it was a defective fresh import that had introduced the disease (it demonstrated some political concern about old stock being sold into the market though, as well as how long the canning process can actually preserve food). 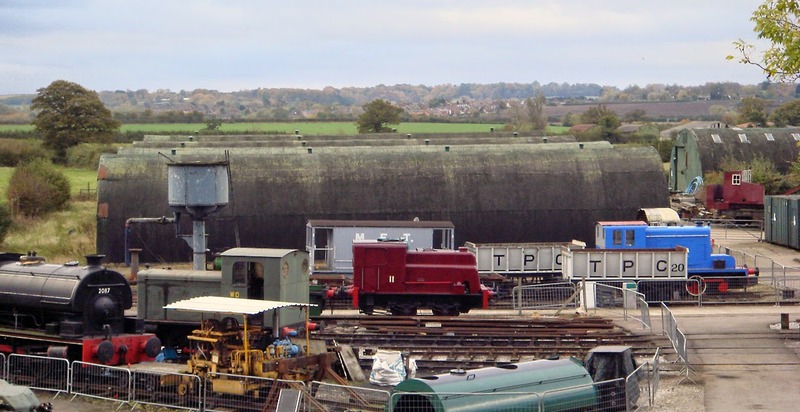 By 1991 UK stocks had fallen to just 200,000 tons and the buffer depot system was at last abolished, the site at Quainton being closed and eventually purchased to enlarge the adjacent railway preservation centre. It is perhaps sobering to think that today the stocks held by supermarkets are probably good for about 12 hours and that this would be no more than double if it included food elsewhere in the supply chain actually in the UK and moveable. There are no strategic stocks at all (the fuel strikes a few years ago brought this home forcefully). All this is said by way of introduction to certain train service improvements that were demanded for Quainton Road station during 1943. I cannot yet be sure what demanded more trains, but either the buffer depot or PoW camp, or both, are plausible explanations for a change at a time when passenger facilities were generally being reduced. My suspicion is that it was more likely to be the PoW camp that demanded better transport facilities than a series of sheds requiring minimal supervision (but perhaps just an armed guard). These improvements have exercised the lively imagination of several transport authors who have referred to the ‘resumption’ of Metropolitan Line services to Quainton Road. This, I feel, wholly misrepresents the position and to the uninitiated might suggest provision a train service of the kind enjoyed by, say, Uxbridge or Oxford Circus! Nothing could be further from the truth, so I had better explain. The railway north of Harrow-on-the-Hill, all the way to remote Verney Junction, was leased to and operated by the Metropolitan & Great Central Joint Committee, a legal entity set up in 1906. Operations included the station and goods yard at Quainton Road. By 1933 the Committee’s owners were the London Passenger Transport Board (as successor to the Metropolitan Railway) and the London & North Eastern Railway, as successor to the Great Central. The Joint Committee employed its own station and goods staff, ran the stations, issued the tickets, collected the fares and was responsible for the timetable. The Committee operated no trains of its own and local train services were operated on its behalf by the LPTB or the LNER as convenient, the Committee paying the operating company for the service provided. Study of time tables suggests the Committee was largely indifferent about whose trains fulfilled the schedules, though obviously only the Metropolitan could run through trains to the City and this was a factor in the Metropolitan having the range of timings it did. In addition, LNER express trains from much farther afield had to be accommodated as that company had the right to run a certain number of through trains (but the rights did not specify set times); there were not many of these so the problem could be managed without much difficulty. There was a complex clearing system which settled at weekly intervals the respective amounts retained by the Committee from through fares and the payments to the train operators for services provided. In those remote parts of the line north of Aylesbury, passenger traffic was not abundant. All the stations were remote from even the nearest tiny villages and the terminus at Verney Junction served only a pub and the odd poorly-timed connections with the Oxford-Cambridge railway. The summer 1934 timetable shows that between Aylesbury and Verney Junction there were six LNER shuttle trains each weekday, each way, and two Metropolitan trains. Another Metropolitan train got as far as Quainton Road, where it turned round and this connected into one of the shuttles which began and finished at Quainton Road rather than Aylesbury. These all called intermediately at Waddesden, Quainton Road, Grandborough Road and Winslow Road. It may be noted that only the Metropolitan then offered through trains to points south of Aylesbury, but these both ran late in the day and one of those only went to Harrow. Almost certainly they were provided for operational convenience as it is inconceivable the traffic required it. As the Joint Committee was indifferent to who provided the trains, it is a moot point whether these odd trips constituted a Metropolitan Line ‘service’ as such. In any event, by 1936 traffic levels were dire and there was some road competition. The joint Committee therefore withdrew the local train services, resulting in the closure of Winslow Road, Grandborough Road and Waddesden stations. Quainton Road remained open and continued to be served by LNER trains along the Great Central line, with the Verney line remaining open only for freight traffic. With most of the infrastructure remaining, the cost savings from withdrawing the passenger service cannot have been very great. London Transport is often blamed for directing the closures, a variety of implausible reasons being suggested. It is true that as half-lessees of the Joint Committee the LPTB had a significant say, and it is true that this area was both outside the statutory LPTB area set up by the 1933 Act and also incapable of developing much passenger traffic. It is also true that the LPTB had some significant financial difficulties looming and not much cash to support loss-making services, either directly or through its joint lines. However, I think harder reflection suggests these stations would almost certainly have closed anyway before long, even if it had been left to the LNER alone. All this left Quainton Road with just six passenger trains a day, each way, plenty for the prevailing traffic and timed to allow a day in London or an evening out in Aylesbury. The 1939 service is shown in the following table. In all the following tables, times given are at Quainton Road (for ‘up’ journeys) or Aylesbury (for ‘down’ journeys). Some of these LNER trains ran ‘express’ to or from Aylesbury from Harrow or Marylebone, but some trains served all (or nearly all) stations between Aylesbury and Harrow, again supporting the view that the Joint Committee was indifferent about which company provided the trains. The onset of World War II restrictions soon saw the service culled to just three trains a day (two in the morning and one in the afternoon) which wasn’t much good for anything. By 1942 another trip was being operated, restoring a usefully-timed London evening departure. These trains were long-distance main line trains to or from Brackley, Woodford and sometimes Leicester, Nottingham or Manchester (north of Aylesbury, virtually all were all-stations trains, some with excruciatingly long running times). It is at this point I need to return to my original theme about the need for additional trains in 1943, to meet some government purpose. The initial change was made from 5th April 1943 when the Joint Committee arranged for the LNER put on a 17:30 departure for Marylebone; this started its journey at Quainton Road using stock normally stabled at Aylesbury. A second LNER train (17:00 ex Marylebone) was extended from Aylesbury at 18:51 to arrive at Quainton Road at 19:00; this returned south at 19:08, in passenger service, to Aylesbury where it terminated and stabled. From the same date London Transport was required to extend to Quainton Road the 22:00 train from Baker Street, which had hitherto stabled at Aylesbury; it arrived at Quainton at 23:43 and returned to Aylesbury empty. 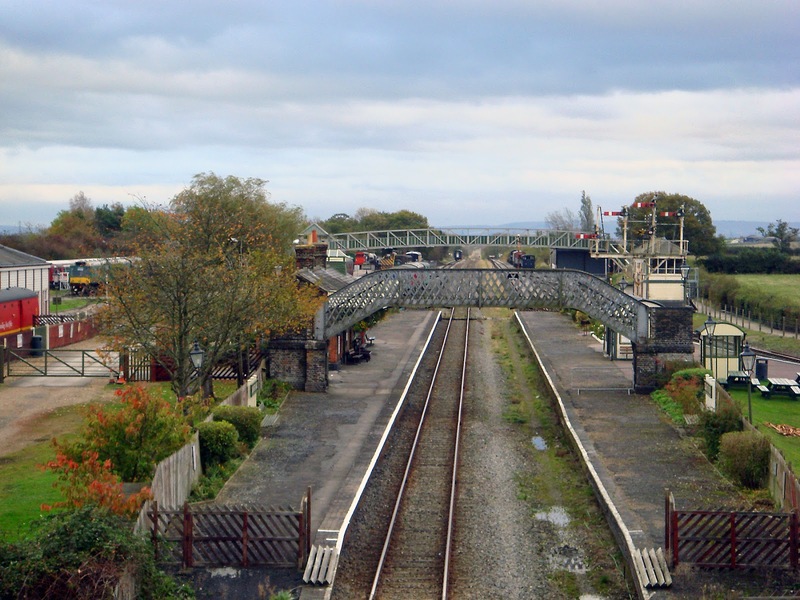 At that time there were no local LNER trains that could be redeployed and the option instead of stopping the 22:00 Marylebone – Manchester express at Quainton Road (which it was timed to pass at 23:13) was understandably regarded as unacceptable. We should not forget that even though this lone Metropolitan train went further than Aylesbury, it was still along tracks part-owned by London Transport and in any case the locomotive power had since 1937 been provided by the LNER, with LNER drivers, on behalf of LT. This arrangement, undertaken for administrative convenience with one late-night train in one direction only, cannot, surely, justify the suggestion that the Underground had resumed operation to Quainton Road! In fairness I should say that on Saturdays (only) the 18:51 Aylesbury-Quainton Road and 19:08 Quainton Road – Aylesbury workings were also provided by an LT train rather than an LNER one, purely because the disposition of rolling stock made this more convenient, but I don’t think this seriously challenges my point. A new timetable came into operation within the month, on 3rd May 1943 and this refined the changes. The late night Metropolitan working continued unchanged but the late evening train was adjusted to be operated Monday-Friday by LT rather than the LNER (LT already ran this train on Saturdays). The new working saw it formed northbound by the 16:43 from Liverpool Street, departing Aylesbury at 18:40 and arriving at Quainton Road at 18:49. It formed a 19:03 departure from Quainton Road for Wembley Park, thence Neasden depot (later timetables saw the train forming a Baker Street service). These ‘extra’ trains north of Aylesbury did not appear in the passenger timetable whilst the war was on, perhaps confirming they were there only for those who needed to know; they did appear in timetables when the war finished. This is all an area that needs further exploration. Another timetable is shown below showing further variations. With minor variations these arrangements carried on until 29 May 1948. From the following Monday the late night Metropolitan train was simply withdrawn north of Aylesbury, while the early evening service was adjusted to be operated by an Eastern Region train instead; this was the 18:05 from Marylebone to Woodford, departing Aylesbury at 19:34 and calling at Quainton nine minutes later. After that, only British Railways’ Eastern Region trains called at Quainton Road until the Great Central route closed in 1966. The old Verney Junction route finally closed in 1947; such freight as remained was operated via the chord at Calvert, opened during World War II and better suited to surviving operations as it avoided shunting at Verney Junction. London Transport’s interest in Quainton Road ceased in 1948 when the former joint line north of Aylesbury was allocated to British Railways to operate. Of course, we are now staring East-West Rail in the face—the scheme to rejuvenate the old Oxford-Cambridge Railway. This scheme includes the introduction of passenger trains from London via Aylesbury and the Calvert curve towards Bletchley, and will pass through Quainton Road. I am not sure whether the decision has yet been made to double the track along this section. One cannot help wondering whether the locals will clamour to reopen to ordinary passengers the station at Quainton; this is at present in the hands of the Buckinghamshire Railway Centre, which probably didn’t expect regular passenger trains to be tearing through (actually the Chiltern trains just need to stop there—there are precedents for privately run national rail stations!). Quainton Road Station – what changes to come? This entry was posted in London Underground and tagged Historical. Bookmark the permalink.